Sourced from the finest sustainable tree plantations in Indonesia, our 18 Bottle Stackable Wine Rack Kit is now more durable, more beautiful and more eco-friendly than ever before. Stack on top (while supporting to the wall) or side-by-side. will these fit pinot noir bottles? Not very well. They will fit in, but it's tight. You may not fill the entire shelf, if you have a lot of the big base bottles. The 18 Bottle Stackable Wine Rack Kit (Natural) accommodates all 750 ml bottles of wine. The rack seems to fit all 750 ml bottles. how many rows can I stack? BEST ANSWER: The 18 Bottle Stackable Wine Rack Kit (Natural) can be stacked as high as you like but you will need to attached them to the wall so they won't tip over. If you can find a stud, even better. I have four tiers, but it is stable enough to hold more, as long as there are no small kids around. Is there a top finishing shelf? There is no top shelf on this rack. Here are the dimensions that are in the product description. I found them to be accurate. Purchased two sets -The measurements of these racks is almost 35" not 34" as described - this created a problem as I was installing them in a bookcase structure that was 34 1/2" and when I tried to put them in my structure they did not fit- I had to saw off 1/2" from each end. 2 of the racks were warped. Additionally 3/4 of the peg holes are NOT lined up so I could not use them. I used wood glue to set the racks in the end pieces. The weight of the wine bottles seem to solve the warp issue. These are fine if you want or able to alter them. Good for an inexpensive wine solution that is not seen by guests (mine are hiden inside a closet). Sturdy and easy to assemble. Very sturdy. I used a dot of "Earthquake wax" on each bottle to ensure that there would be no slippage. I placed this wine rack on a metal shelving unit in my basement that replaced a poorly handmade rack of mine that couldn't accommodate bottles of varied dimensions. This new unit has great functionality, looks professional, and suits my needs. With limited space in my basement, but with existing shelving racks, I plan to purchase additional units that will easily fit into them. It is very attractive in my wine closet. Easy to assemble and attractive. Only with I had bought more! I put this item on the bottom shelf of my pantry for wines that are frequently opened for cooking or the go to bottle of wine that needs no ageing to enjoy. It is perfect! Sturdy, holds the bottle well. Requires no tools to assemble; uses little space; holds wine bottles easily and securely; looks nice; and was inexpensive. This was the first wine rack that my fiancee and I purchased when we found ourselves with two many bottles to just have on a counter top in our kitchen. This rack is well-made and perfect for a kitchen to nicely display and store your bottles. I created a wine cellar under the stairs and these products fit the bill perfectly. I use this product next to my wine refigerator. I have bought 4 of these, they can easily stack or take one level from one and add to another for a 3 level in one place and a single level someplace else. If you're fitting wine storage into kitchen cupboards these are wonderful!! I have one in the cupboard above the refrigerator and 3 in the bottom of the pantry and another single layer in an empty shelf in the master closet. Condo living poses challenges for wine storage! Very nice design, easy to assemble. Great! My wife put it together in a matter of minutes and it fit perfectly with the pre-existing wine rack from Wine Enthusiast.. I have this in my Wine Cellar with at least 6 other similar racks. They have been painted black to match the interior of the Cellar. They are excellent. They look good, they are excellent for the purpose of storing my wine bottles. I could not be more pleased with them. Easy to put together, stackable, leaves space underneath - which helps with cleaning the floor, and sturdy. Perfect for our needs. Easy to put together. Placed in Basement. Don't think this is for a dining or living room. I'm thoroughly happy with my wine racks. They are everything I expected, and more! This is a great piece for storing your bottles in your basement or on your kitchen counter...if you have the counter space. We bought two and stacked them in the basement for storage. If you have a number of larger bottles (champagne, etc. ), you'll need to keep separate because they won't fit on the lower level. Really well constructed. In the basement stacked 10 high (5 packages), still sturdy at 10 high. The boxes were a little damp but that had no effect on the racks, since they were well protected inside the packaging. The dowels need to be improve, I replaced mine with better ones from local woodworking store. Also, the fit is just a little loose, could be better fit. I read all but a few of the reviews, and would I put it smack dab in the middle of the living room? No. That's not what it's for. Now, does it hold my growing collection securely in a converted storage closet that is now my wine cellar? Yes. It's purpose built. Not a showpiece. Take your time with the construction, tap the joints/dowels in gently with a small non-marking mallet and secure with epoxy or wood glue. I have these assembled now 4 units high and it is bombproof. No sway, no wobble, and VERY sturdy. Highly recommend. Purchased this because it was easy to fit onto our existing shelving. It's a good, compact design, and it's nice that it is extensible. The unit was straight forward to assemble, with only a small hammer needed. Rack works well with the space I had available. Sturdy once assembled. Easy to assembly. Only slight con, as others have noted. The wider bottles are tight in their space but does not hamper capacity. I am glad I ordered. Just what you'd expect from the ad. Pretty solid wood frame. I stacked 3 sets and filled them all. Is sturdy and just fine for what I wanted. Nothing fancy. The wine rack is an excellent system for storage especially because you can add more racks as many times as will fit up to the ceiling. The racks fit together well but do get a bit flimsy the more you stack, more than six would not be recommended. All in all, a good bargain with room to grow. Rack works great. Was easy to assemble. Wide bottom bottles don't fit side by side. Otherwise, exactly what we were looking for. Works for most bottles. Not well configured for Pinot Noir bottles. Would not recommend for any bottles with wider bottoms. Delivered fast and with no problems. Using this rack on the bottom of a sideboard that is not visible. It's functional so little regret on that. But fit and finish were not impressive. Glad it's hidden out of sight. This product was engineered poorly, assembly is far to difficult because dowels are to big in diameter and hole are misaligned. Poorly designed. The wooden dowels used to attach racks are flimsy - they break easily and there is no easy way to get them out of the holes once they're broken. Suggest they be replaced with plastic or aluminum dowels of sturdier design. Also, the bits and pieces of styrofoam used as packing material were difficult to clean up. Making this rack functional seems like the easiest task in the world, yet for some reason, the manufacturer created holes/dowels that don't fit each other. And then, when you use pressure to piece together the wine rack, the dowels broke off into the holes drilled into the legs/racks. Maybe I got the defective rack, but I don't see how 16 of 16 holes were not made to accommodate the dowels. 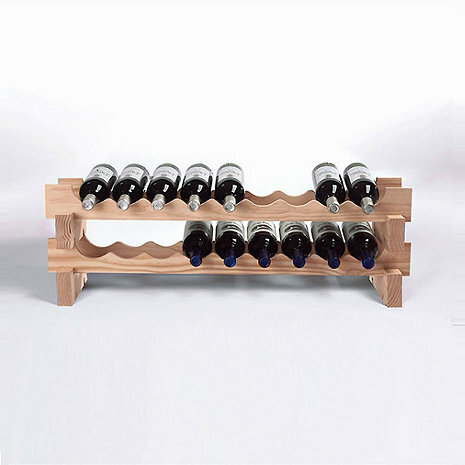 This is a really simple wine rack and just what we needed, but the wooden dowels that are provided are difficult to work with. They need to be lined up exactly in order to stack the units and if you need to adjust as you are trying to line them up (one person picks up their side a little more, etc. ), the dowels break very easily and are then stuck inside the holes. So now half a dowel is stuck in the hole and you can't pry it out, so you can't stack the racks. I'm not sure what we're going to do, but i'm frustrated that such a simple design has caused us so much trouble and frustration. Am unhappy. The product arrived in good order but three weeks later it is still unassembled. The pegs are too big for the holes and some of the holes are not completely finished. No guidance as to how to remedy this. Tempted just to pack them up and return in frustration.